Many patriots, I believe, are United States History buffs. We spend our time reading about the Founding Fathers, the Constitution, and varying interpretations of the “supreme law of the land”. And we argue incessantly about nit-picky points of legal precedents set by the Supreme Court many years ago. Patriots want to know not only how America got to this point, but why. 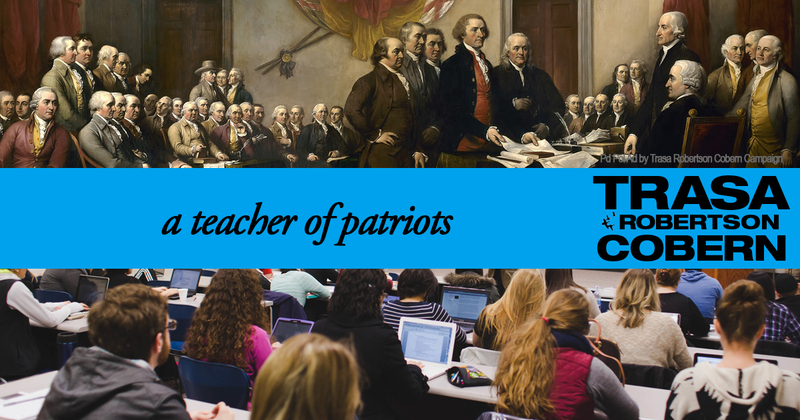 I am lucky enough to be not only a patriot, but a teacher of patriots. I get to go to work each day and pass along to the next generation my love and passion for what has made this country the exceptional and amazing place it is today. I teach United States History to 11th graders every day, infusing every class period with the knowledge of the truth: America is the greatest country in the world. Not that I sugarcoat American history to my students; we speak plenty about the injustices of the past, regarding civil rights of Native Americans and other minorities. We study the historical background of issues that we wrestle with today, such as immigration. We highlight the failures of true equality and true brotherhood that have existed and still exist today. And I challenge my students to be the purveyors of change in that regard, to respect where we have come from but to help take us to where we need to go. We also rejoice in the specialness of America. I like to point out to my students that America is the first and oldest modern republic and that all the supposed “democracies” that exist in the world are attributable to our Declaration of Independence. Many of them even overtly referenced our document when they overthrew their oppressors. We are the first, and we lit the torch for those who followed. While we didn&apos;t believe in the modern idea of equality at the beginning, despite “all men are created equal”, we have expanded democracy and representative government over time. We once believed only white men with property should vote; now, every man and woman – of every color – over 18 can vote. I emphasize to my students how hard the process was for those different groups to gain the right to vote, and then I throw down the gauntlet…if they fought so hard and so long for that right, who are you to disrespect it? I challenge them to become informed voters and exercise that most-American right and privilege. I challenge their assumptions as well, presenting them with real issues and platforms, without party tags, to help them discover their real allegiances. While my professional goal is, of course, to help my students pass the class and pass the state STAAR End of Course exam, my personal goal is to create patriotism in each student I teach. I recently had a former student return to ask for my recommendation for his entrance into the Marine Corps. That was a wonderful moment. Here was a young man, willing to go anywhere for the love of this country…and he asked me to vouch for him. What an honor. God bless the USA and our men and women serving, and all of us who are patriots in our hearts.